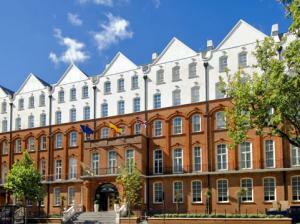 The four-star NH Kensington is the begin to a wonderful London getaway. Centrally located in London’s Royal Borough of Kensington and Chelsea, the hotel is surrounded by historic buildings, famous cultural institutions, and world-renowned destinations for shopping and nightlife. Just minutes from our doorstep you’ll encounter Kensington Palace, Royal Albert Hall and The Natural History Museum, as well as the fashionable shopping hubs of Knightsbridge and Sloane Square. With the Earl’s Court tube stop just a short walk away, you can enjoy easy access to countless locations throughout the city and beyond, including both Heathrow and Gatwick Airports. The hotel offers 121 guest rooms, each boasting stylish interiors and a host of premium amenities. Productivity and relaxation are always at hand with in-room features such as a work desk, internet access, a minibar, a flat-screen TV, soundproof windows, and a plush, 25 centimeter-thick mattress. Savor world-class dining in the comfortable confines of the hotel at Huntingdon’s Restaurant, offering an extensive daily breakfast buffet and elegant al fresco meals in our Garden Lounge Bar. The restaurant is also available for private parties, which, along with two modern and functional meeting rooms, make the NH Kensington ideal for receptions, conferences, and exclusive events of all kinds. The NH Kensington houses two versatile, light-filled spaces for business meetings, private dining, and exclusive events for up to 25 people.Function roomsOur two rooms (Kent and Sussex) each boast a fully equipped, stylish setting for events of up to 25 people. A wide array of state-of-the-art technology is available-from overhead projectors, TVs and DVD players to video conferencing and wireless internet access.Function room audiovisual equipmentExtensive range of audiovisual equipment, direct outside telephone line, Wireless Internet access. Copying, printing and faxing services are available at the reception desk, located on same floor as the meeting rooms.